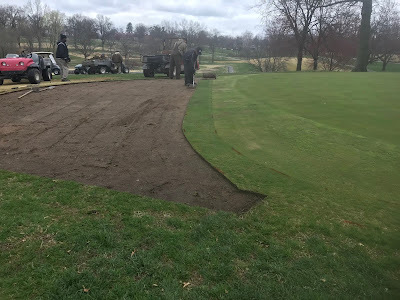 Well, we seem to get a step or two ahead with our work and then 2 step backwards with the rainy conditions we've experiences over the last few weeks. Before starting on some big news on the 2 tee renovation, I would like to discuss the wet conditions we have been experiencing and how it relates to cart traffic. During normal weather conditions, Glen Echo's hill's have a number of springs that emit various amounts of moisture out of our rather tightly bound soils from late winter through the spring season. With a wet winter and now spring, Glen Echo's springs have really sprung this season. When we dry enough to allow carts off the paths, we still have a number of areas that are somewhat damp. We have tried to rope off or place signage out but there are only so many signs that can be placed on a course. 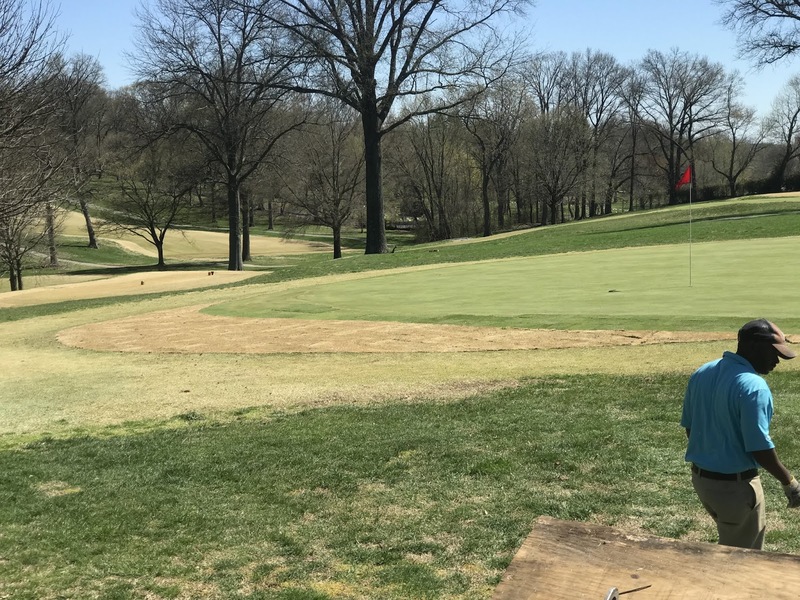 One thing to keep in mind, the lowest area of any hole is has the potential to be the wettest. Please allow me to give an example. #2 toward the metro track fence line has a tendency to be very wet. 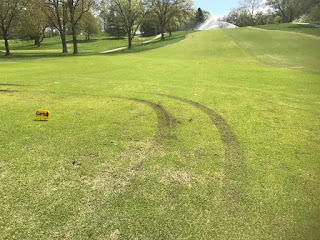 Within 20' or so of the fence your golf cart can end up over its axle in mud and water. 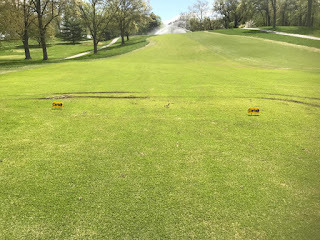 When we place a sign or signs on the course for an area to avoid, our expectation is that you give a wide berth of at least 20-30' feet to the left or right of the sign and 20-30' deep. Going directly behind a sign is not enough latitude to protect our turf. I've attached below a picturse which gives the example of what should not be done with a cart. 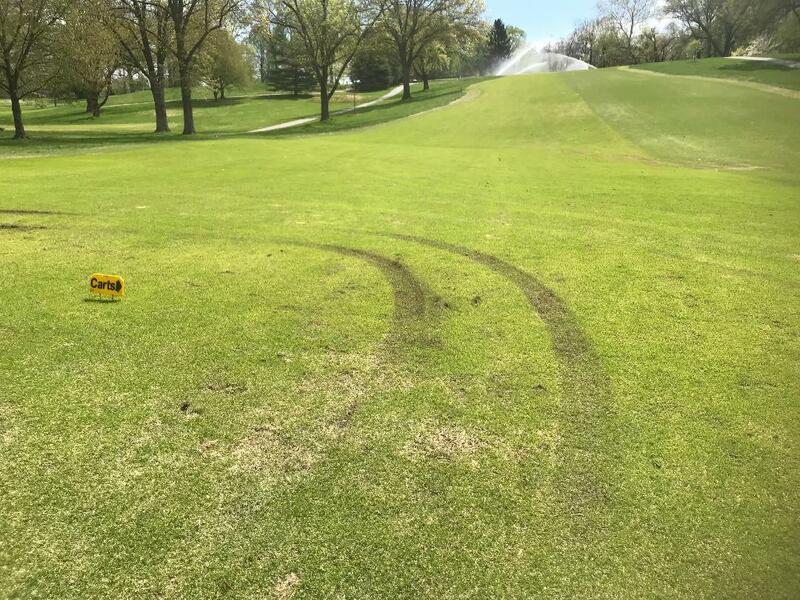 Not trying to make an example out of someone but it is an example for future reference of how to avoid a wet area and not create tire tracks. Tennis courts work is ongoing as the season is getting close. 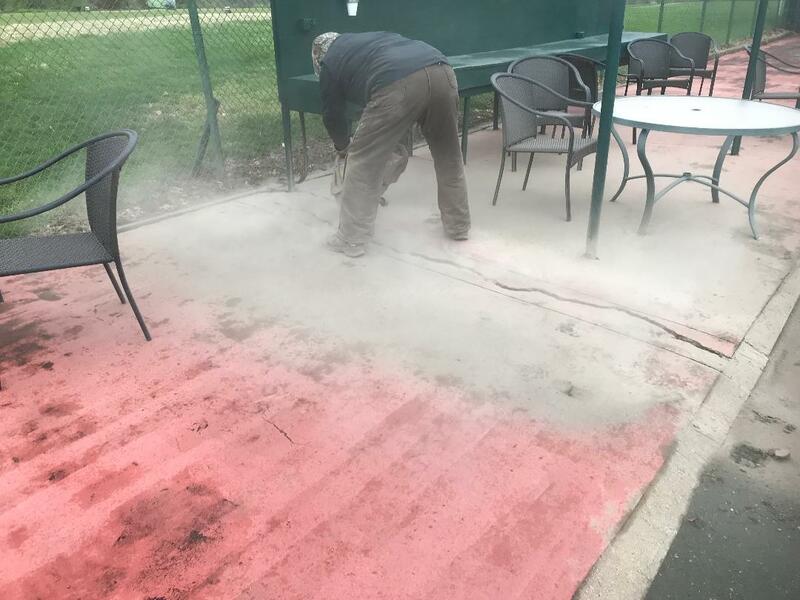 We are repairing the asphalt area adjacent the courts which will include filling some larger cracks with asphalt and then filling smaller cracks with liquid filler. We then intend to paint it a court green pigment. We also must add another 140 bags of clay to the courts in the next few days and then line the courts. Skip cutting a couple of larger cracks out so we can replace with new asphalt. 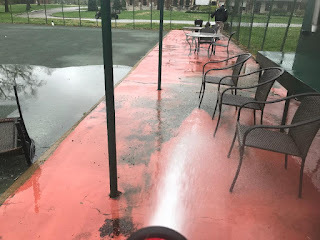 Randy, Randy, Rallo and I cleaned the asphalt area and scraped the worn paint during the rain day we experienced last week. 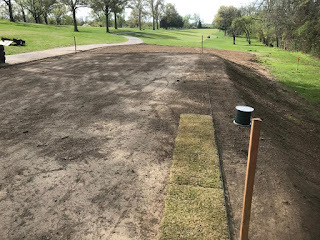 So the big news of the day, 2 Tee surfaces and surrounding area were sodded today. 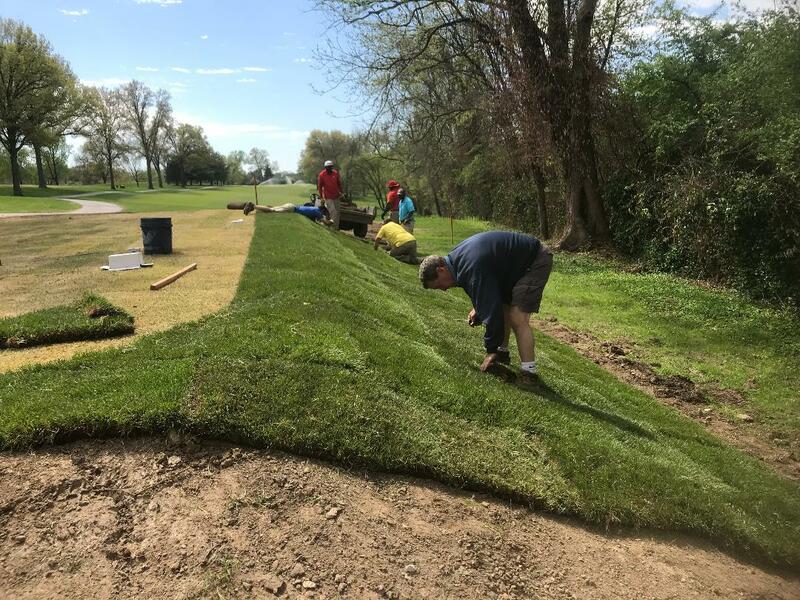 We have a couple of small sections of sod on the back of the blue tee and forward off of the front tee toward the fairway that still must be completed. 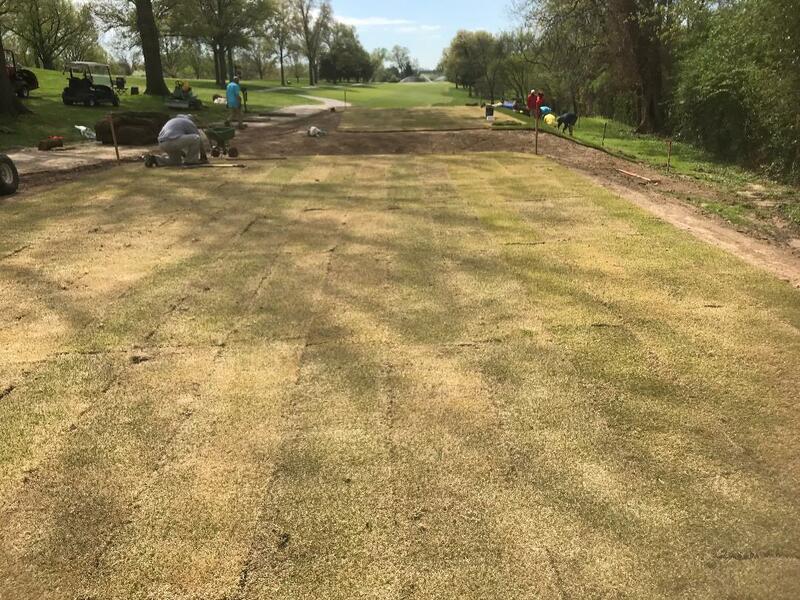 We will finish the remaining sodding over the next few days as weather allows. 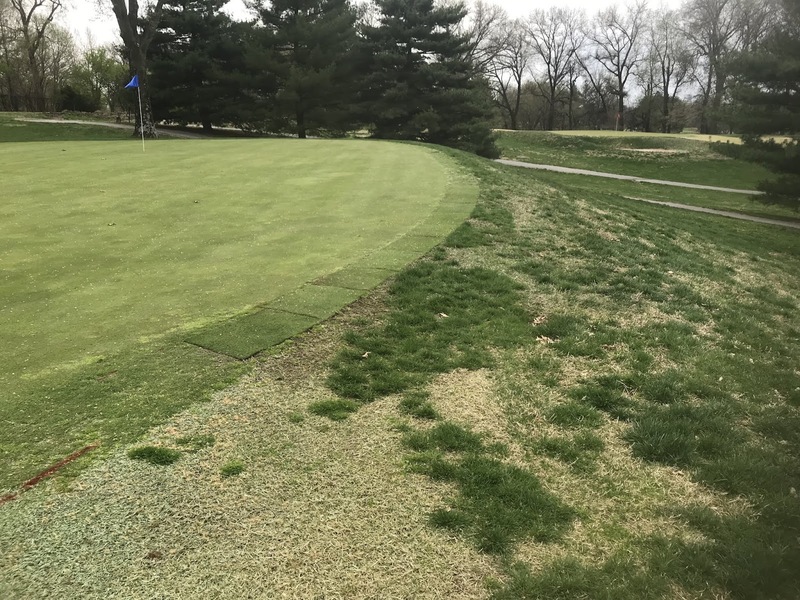 My expectation would be to hopefully open the tees on Memorial Day weekend if all things go well with temperature and not too much moisture. 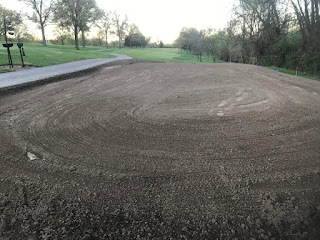 White tee after tarps were pulled off Friday and was graded again by the bunker rake. 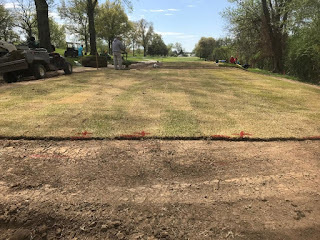 Blue tee was a bit damper but turned out ok.
Mike McNeil from Schaefer-Meyer Laser-leving the white tee Saturday morning. 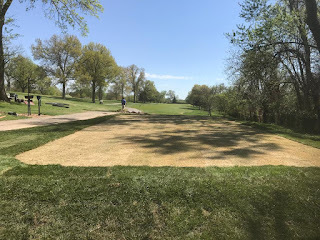 Begging laying the zoysia on 2 tee. Stake and rope to help with alignment. Old tee basically pointed down right edge of the fairyway. Finishing the white tee surface. 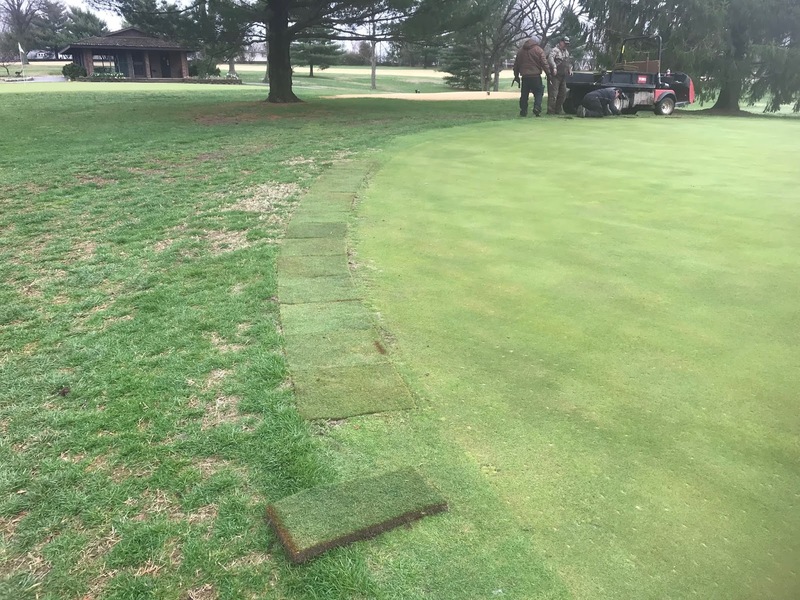 Pinning the sod to insure it stays in place. We intend to mow the top but initially will not mow between the bank and the track area. We will evaluate this as time goes by. It is pretty significantly sloped and we do not have a riding unit that can mow this hillside. 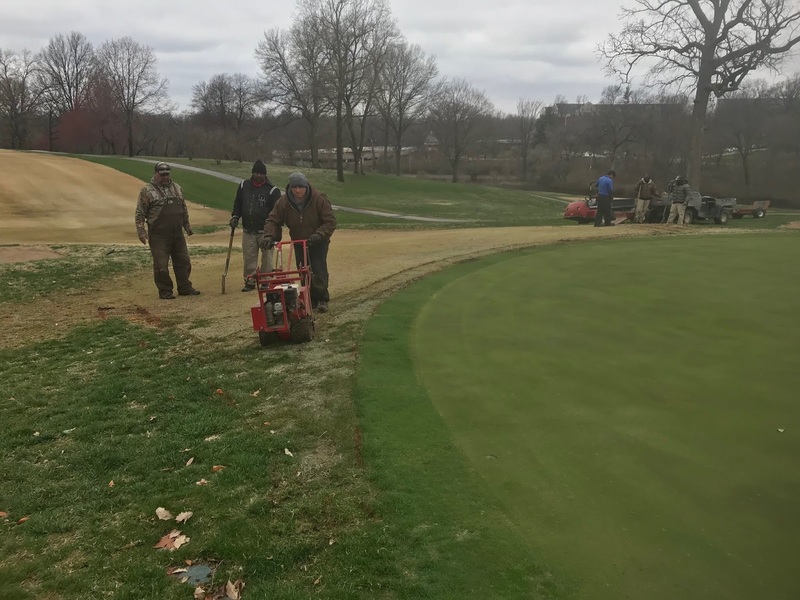 Edging and finishing up on the tee surface. Before laying the sod between the 2 tees. 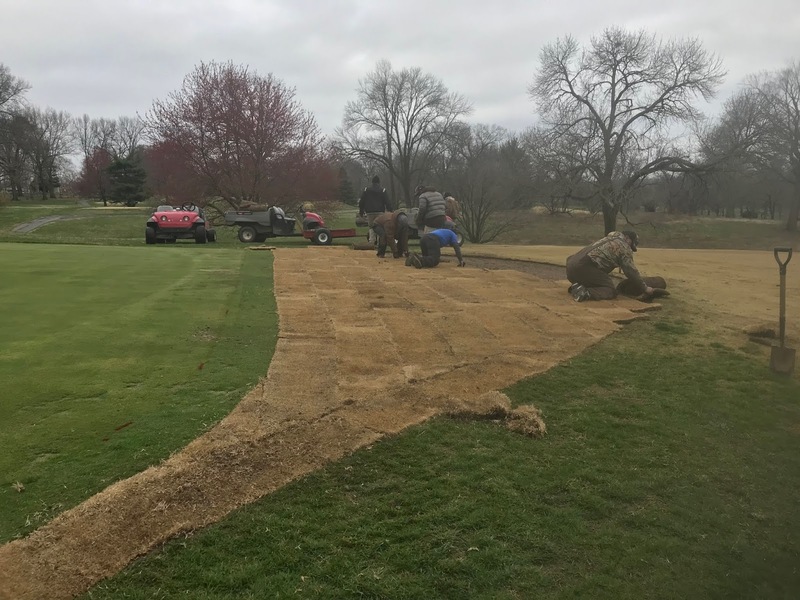 Big roll sod being used in the off tee surface areas to help reduce washouts and save time in applications. 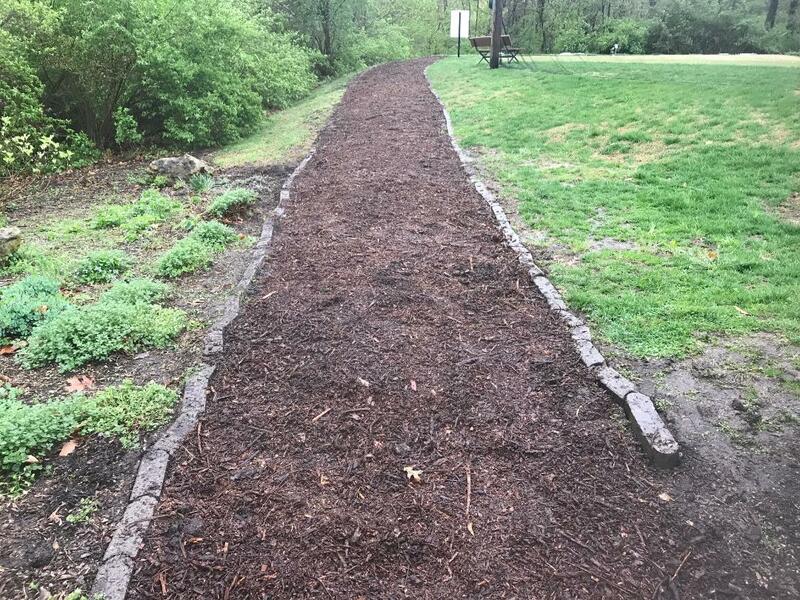 Mulch paths to long range and short range were smoothed and touched up over the last few days as well. Large oak at the start of the fairway on the right of the cart path on #17 had its limbs removed today as we prepare to drop the main trunk hopefully Tuesday. This tree was severly compromised in the last storn and has signficant hollowing in at the start of the crown area which is where the limbws come out of the trunk. Not much of a zombie guy but the staff has been getting that sod zombie strut going pretty good the last couple of weeks. They laid another 500 yards on holes 5 left rough to finish the bunker surround area. 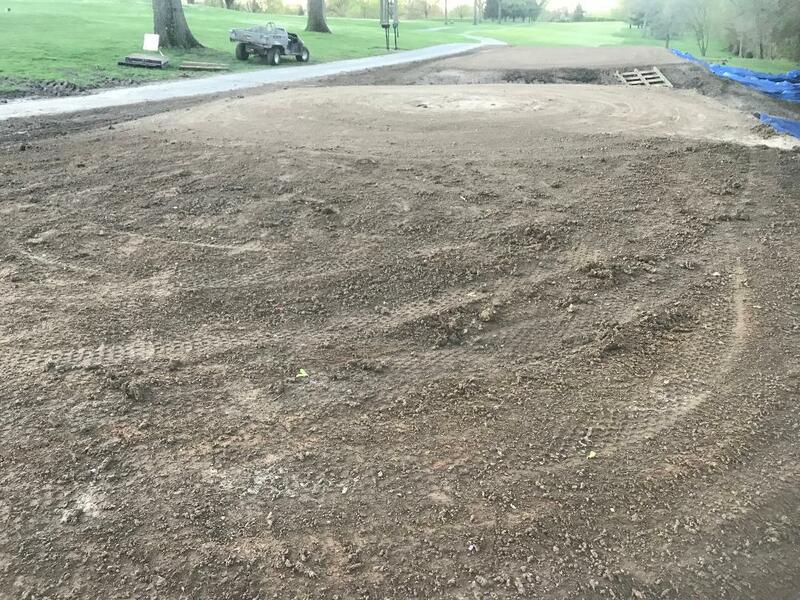 7 back right bunker entrance, 2, 11, and 15 approach's and the east side of the practice green area were all sodded. 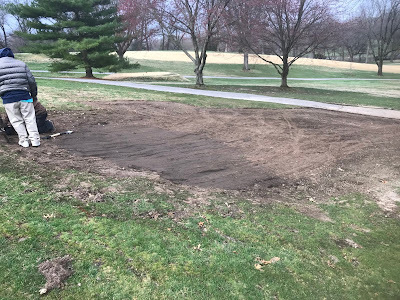 Also a couple of stump holes were covered up and some repair on 4 approach. 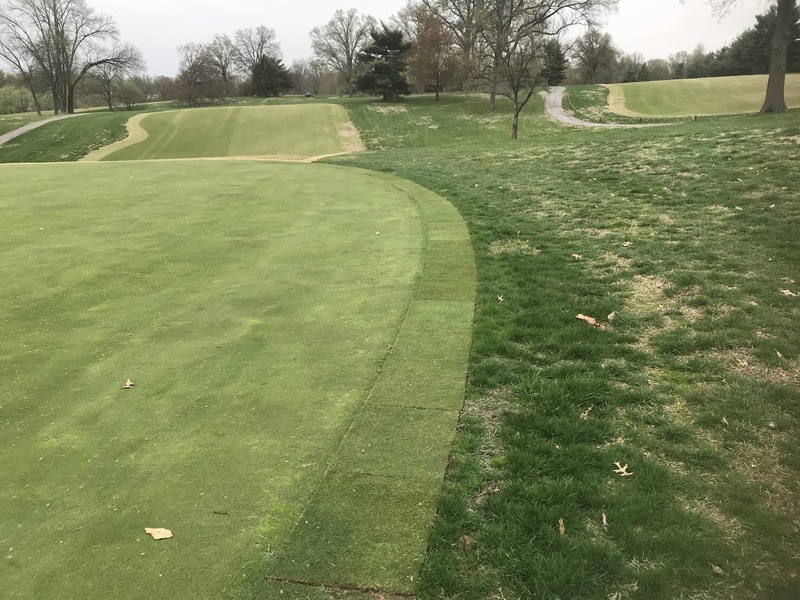 Pulled up some good bent grass on the approaches and laid it on damaged collars. 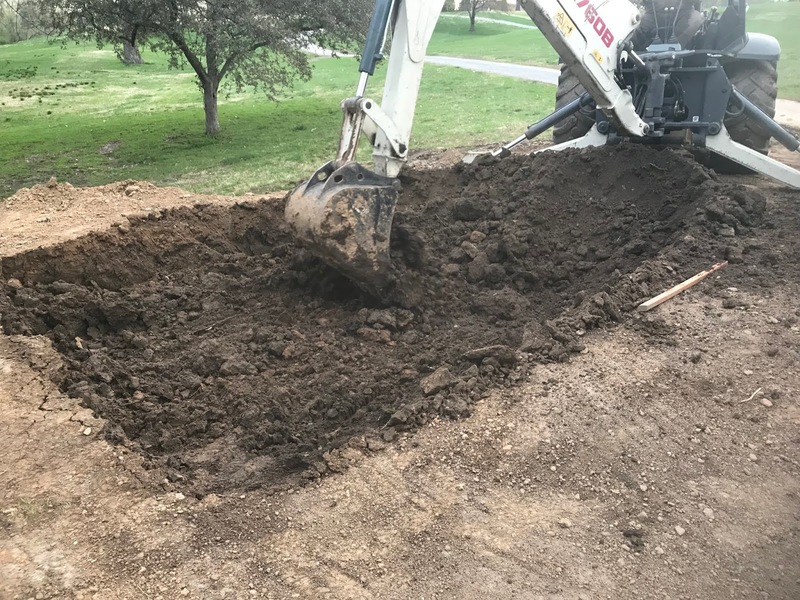 Normally when we have cut off larger areas for repair, we've used a tractor with a blade and the backhoe as well as a dump truck but its been too soft and the areas are pretty sensitive for large equipment. All these areas were hand picked up. 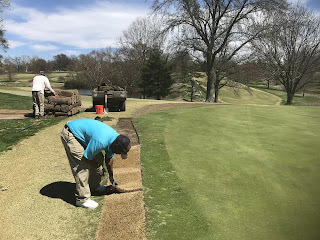 We were able to place the sod nearby this week after our backhoe repaired which kept them from having to load into carts and then unload onto the ground. Staff did a killer job on all of this work! Left collar on #11 repaired. 15 stripped and waiting on sod. 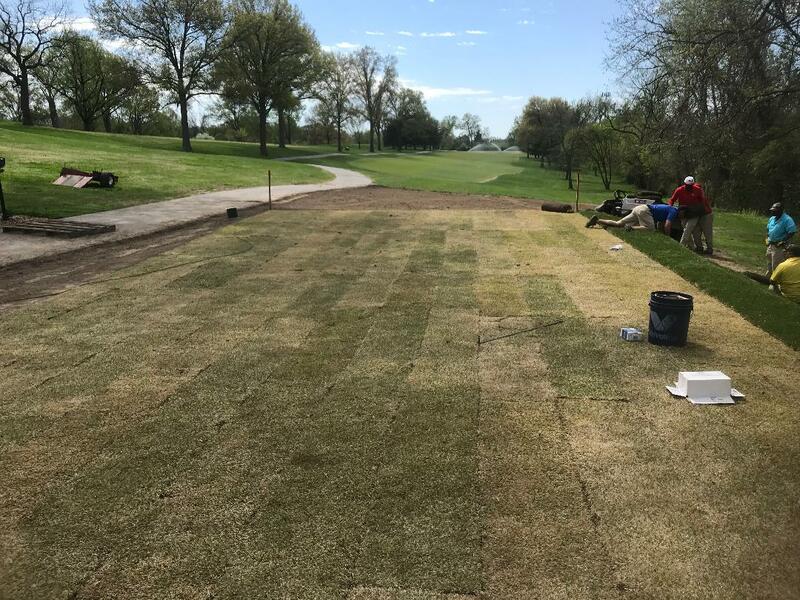 Right side of 15 laying sod. 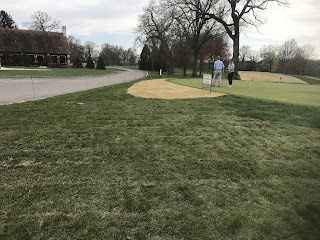 We had completed part of the practice green area near the pro shop and looked at the Pearson Lane side and had to clean it up as well. 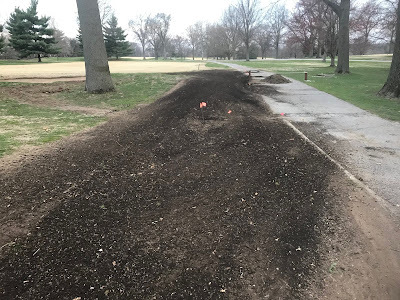 Aerified it heavily and then put a couple yards of compost in place to help soil structure a little. Guys laying the sod on practice area. 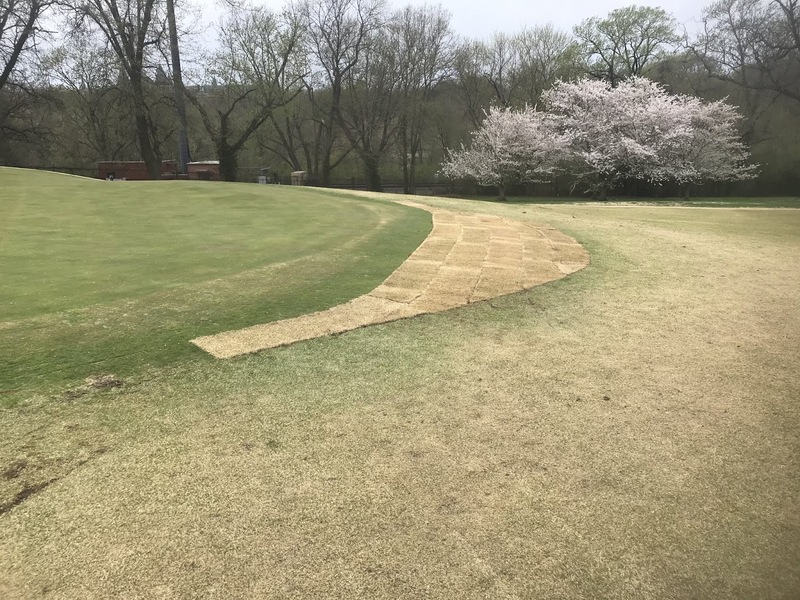 Its been mentioned could we place some zoysia around so you can practice approach bump and runs so we did a decent sized strip on the east side of the practice green. 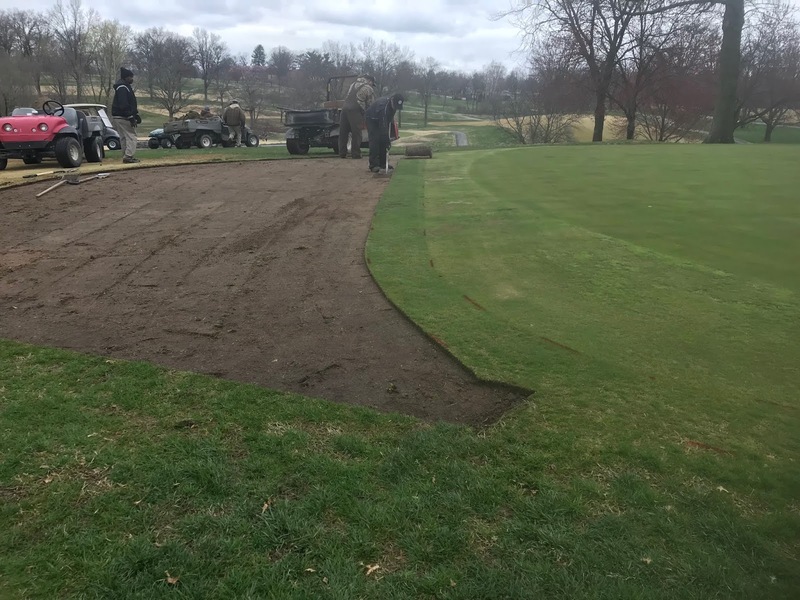 Not really a place to be chunking out areas of sod but should be able to practice and few bump and runs. We might have to close sections of this during the season when play has worn it down a bit. We also put some entrance and exit areas on the pro shop side to try to spread the walk on and off area. 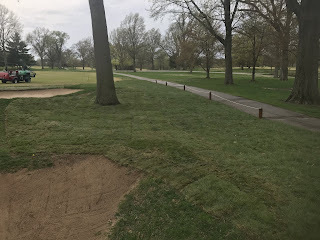 We hope the soil modification, irrigation and aerating we will be doing will help keep this area looking good as well. From the pro shop walk way. Did a larger cut out of zoysia neared Doc Ott's clock area. 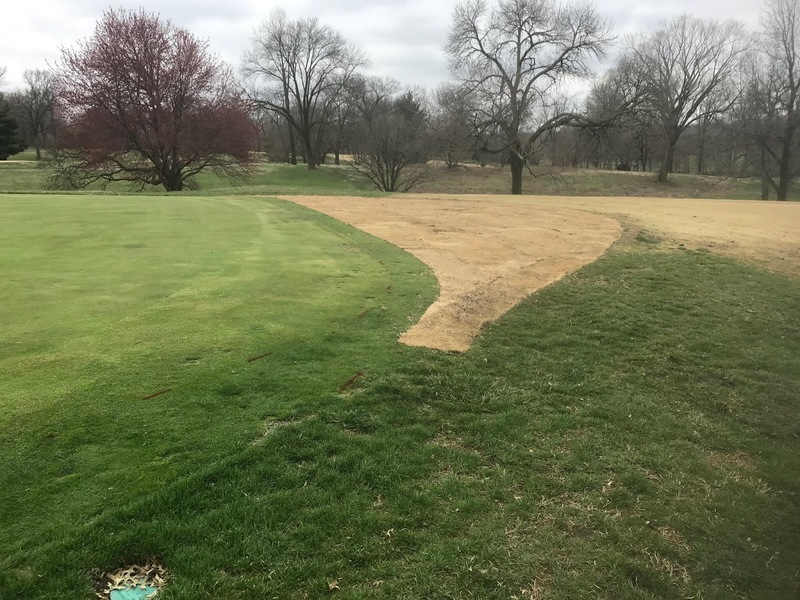 Finished the area between the bunkers. 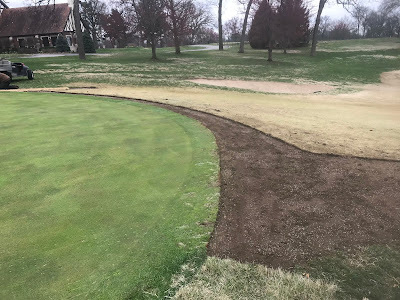 Still have to repair the sod trench line from new irrigation. 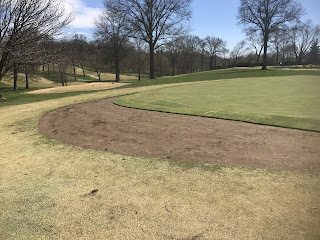 2 approach repair and clean up. The mowing of greens are becoming more regular along with rolling. The first mowing of rough, tees, tee surrounds, fairways occurred this week and bunkers were trimmed up. Finishing up on our pre-emergent applications and we do have a great deal of broad leaf weed control that will take place over the next couple of weeks. Dandelions, clover and some cool season weed control. 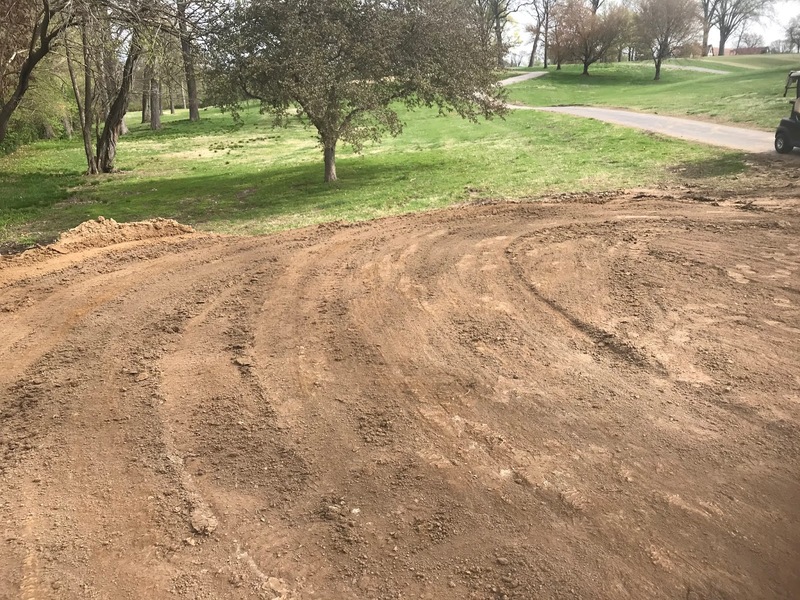 We did some finish grading around the new 2 tee complex. Trying to get our laser leveling contractor in over the next week. 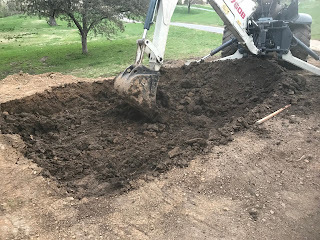 We are going to have to dig out part of the back tee. The soil is soft and pumping so we will dig it out this morning and put some good hard Glen Echo clay in its place. Little video below showing the smoothed out area. 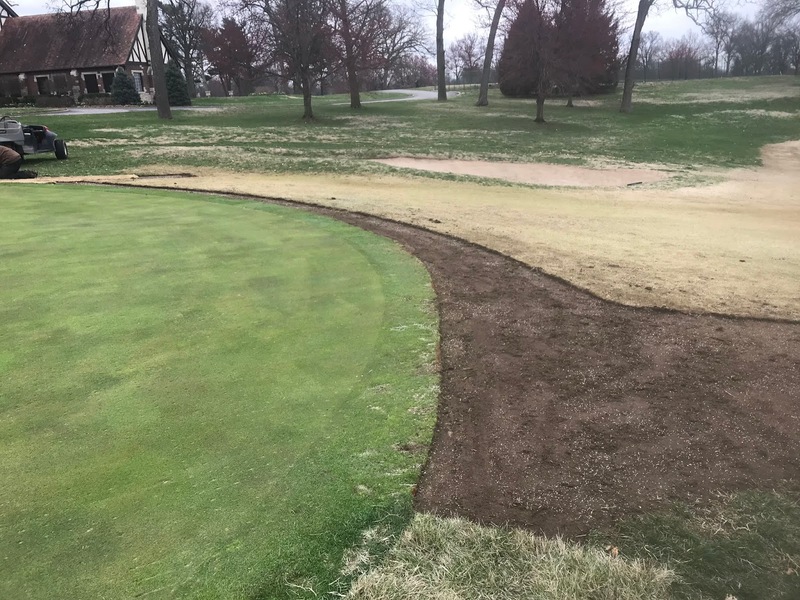 Update on the repair to the back of the tee. 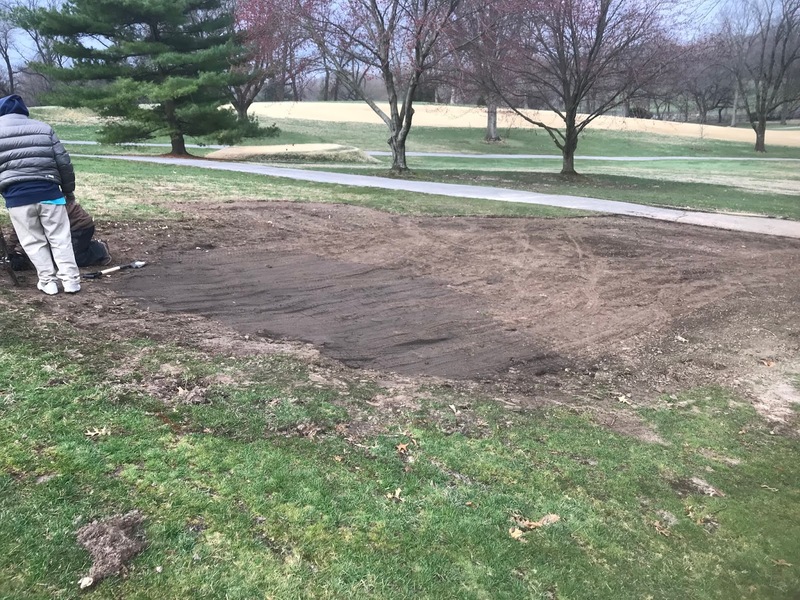 Dug out a 10' x 12' section of the back of the tee this morning and back filled with some Glen Echo clay. 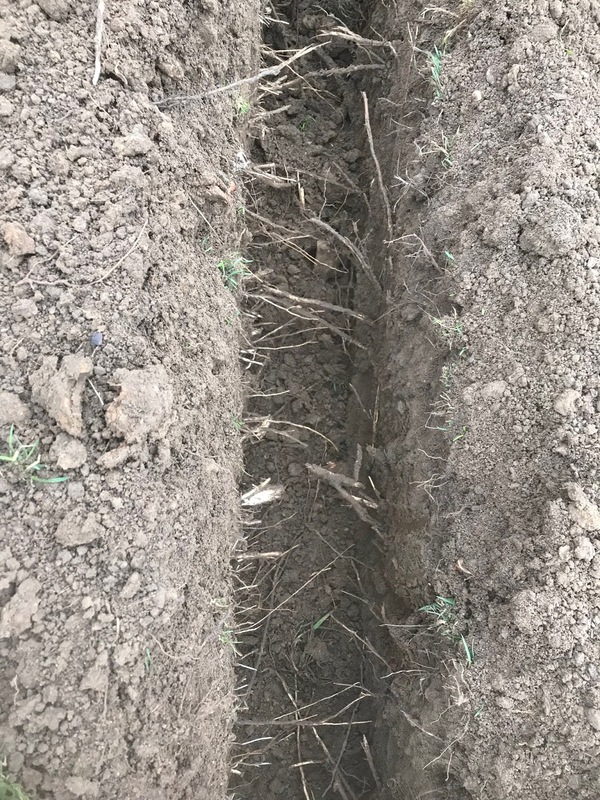 The soil that was originally used was excessively wet and plastic like not allow the surface to firm and ultimately would have settled. The new soil should improve the situation. Skip dug out about 2' of fill that ended up being too plastic/rubbery. Back filled, packed and smoothed over. 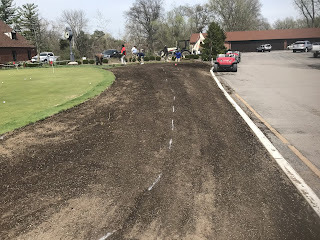 March 22nd and 23rd we did the rough in of the new tees on #2. 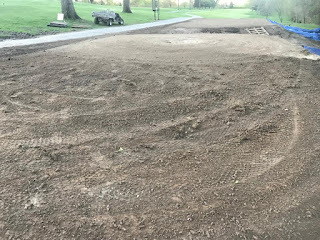 Due to the movement of a great deal of soil and wet conditions every 3-4 days, we are at a pause in work on this project. I would hope if we can get dry in the next week or so we will get the surrounding area of the tee finished graded and prepared for sod. 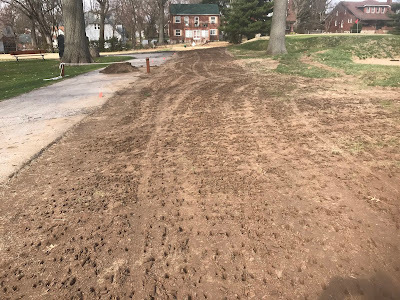 The teeing ground will be tilled and laser leveled by Schaefer-Meyer we hope within the next couple of weeks and then sodded so that the tee will be open for play by mid-May. View from the front of the tee complex. 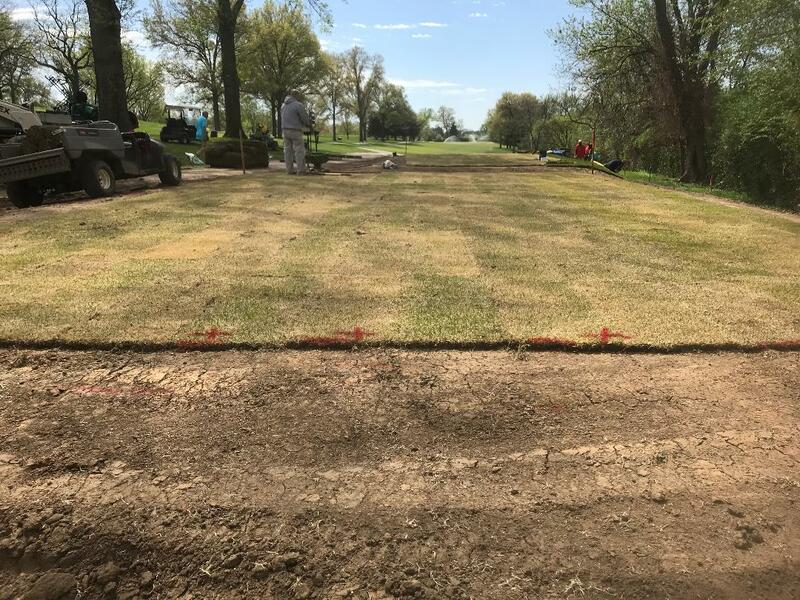 Tees are now set up as 2 separate tee boxes. From behind the tee complex. Sorry for the poor pictures, just looks like a pile of dirt from this level. Had my drone in the air the other day to take pics and crashed into a tree. Once I finish the repair, I will give you an overhead view. 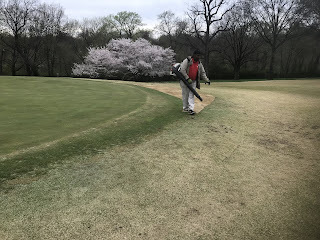 Being the largest group of maintenance folks on staff at Glen Echo, our crew has been assisting in other areas. We spent about 20 man hours power washing the pool wall both inside and out. Also power washed all the walk ways in the front of the building and a part of Pearson Plaza. The staff power washed some of Limestone window sills that we did not get completed last season. The staff with some able bodied assistance have also been busy inside the pool area removing some over grown shrubbery and pruning others. We we were in the process of mulching the upper wall bed when our loader broke down earlier in the week. Once it is back up, we will finish the mulching of this area. We will also be power washing the swimming area of the pool and installing new drain lids and plastering in new frames for the pool system. We will be managing most of the mechanical start up of the pool this season. I attained my pool operator certification for the pool over the winter. 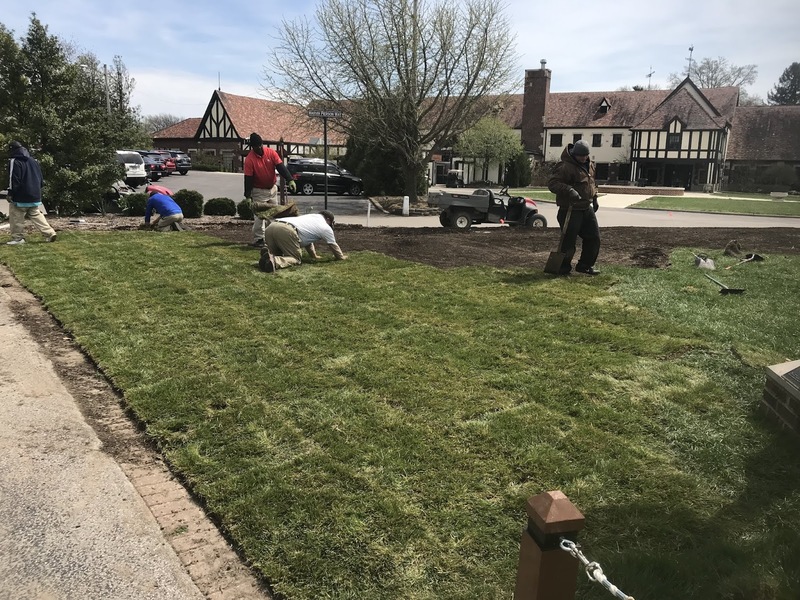 The staff have also been involved in stringing the patio lights and moving equipment to the patio since warm weather is on its way. This week the staff have been extremely busy with sod work. 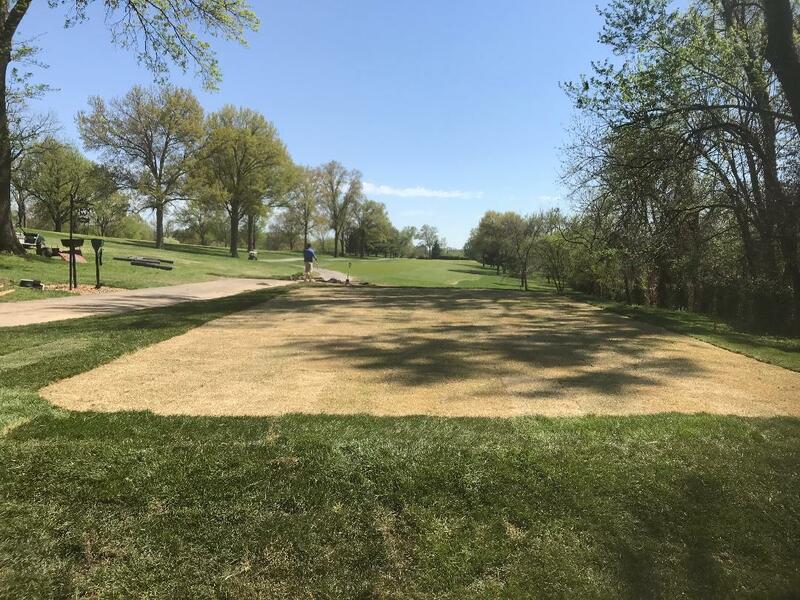 Over 450 yards of old sod was removed and replaced with both fescue and zoysia. HATS OFF TO THE CREW THIS WEEK!! 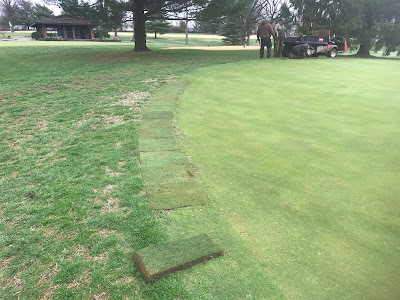 Our loader was broke down and we had to load the sod into carts and then unload it from the carts. 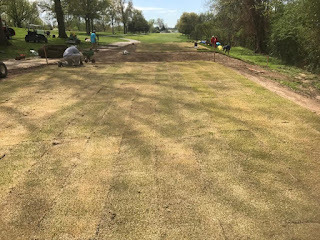 Normally we place the sod right in the area of work so double work for the guys this week because of the repairs taking place to our loader. We first completed the tree removal stump repair and root removal on the old tree near 11 green. 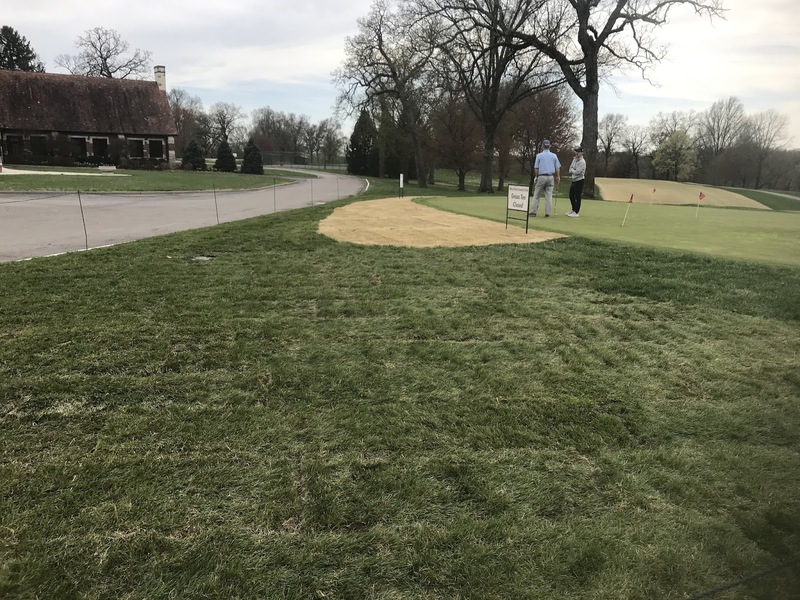 This was replaced with fescue. Area to the right of 11 green. A large amount of roots had to be busted out by hand using axes and shovels. The finished area off the front right of 11 green. We then moved to #5 left bunker area. This area has a number of contributing factors to its look. Small area with a great deal of foot and equipment traffic. 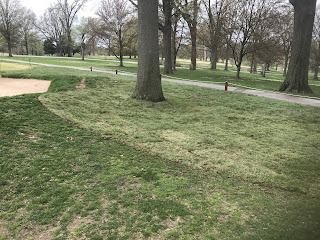 Last year we tried to resolve some of it with walk mowing the area. 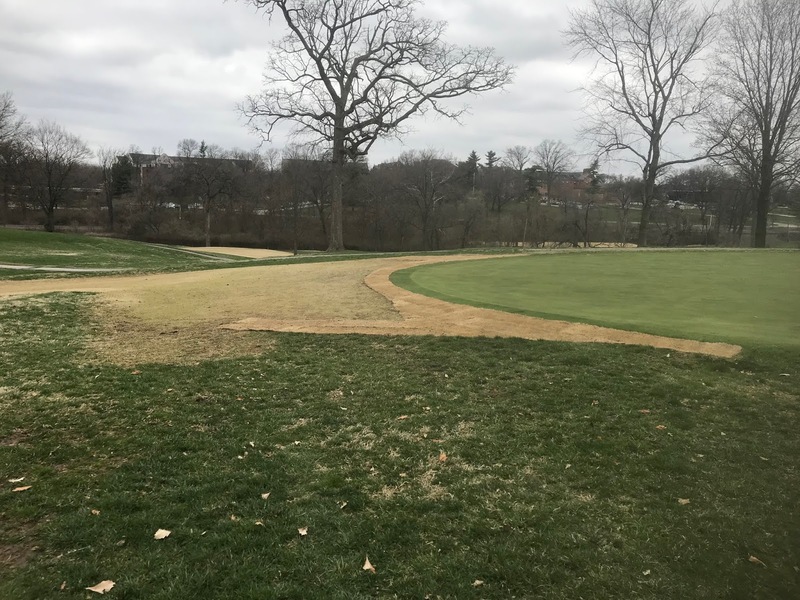 Significant shade and drought is the biggest reason for its decline. 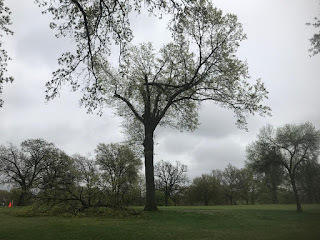 A large Pin Oak is growing right in the middle of this area and robs it of sunlight and much needed moisture. We stripped the old sod away, trenched in some new irrigation heads that will hit just in this area. 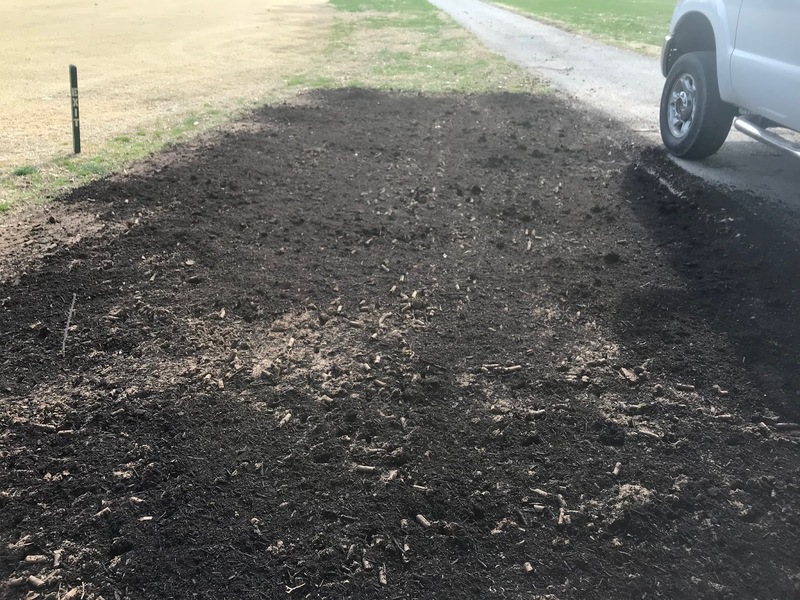 We aerated it and put in a couple of yards of leaf compost. The area was then dragged with a metal drag to break of the dirt turds and move some of the compost into the holes. 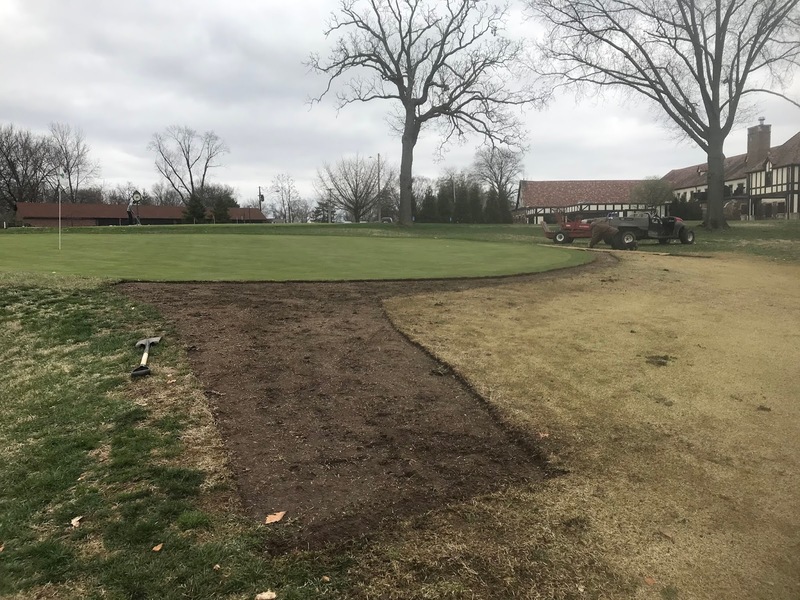 Sod was then added. 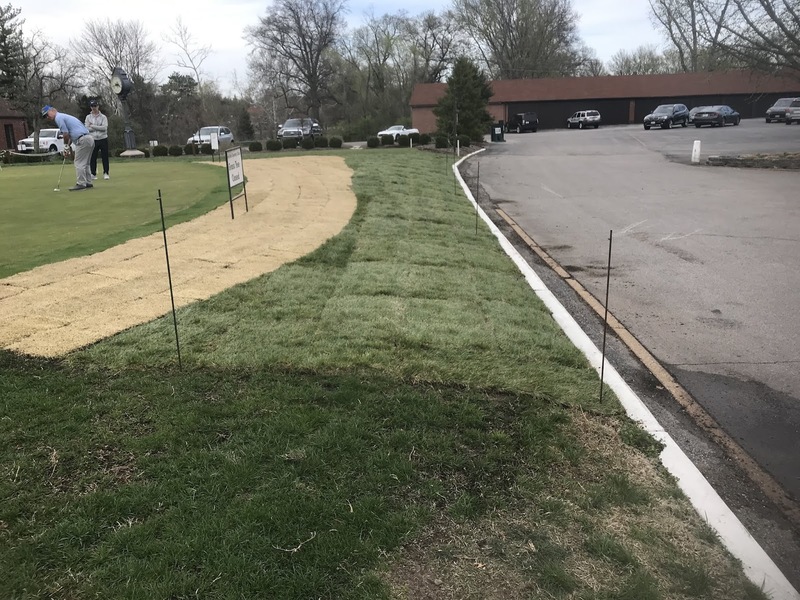 Should see some improvement we hope with new sod and the other work we completed. 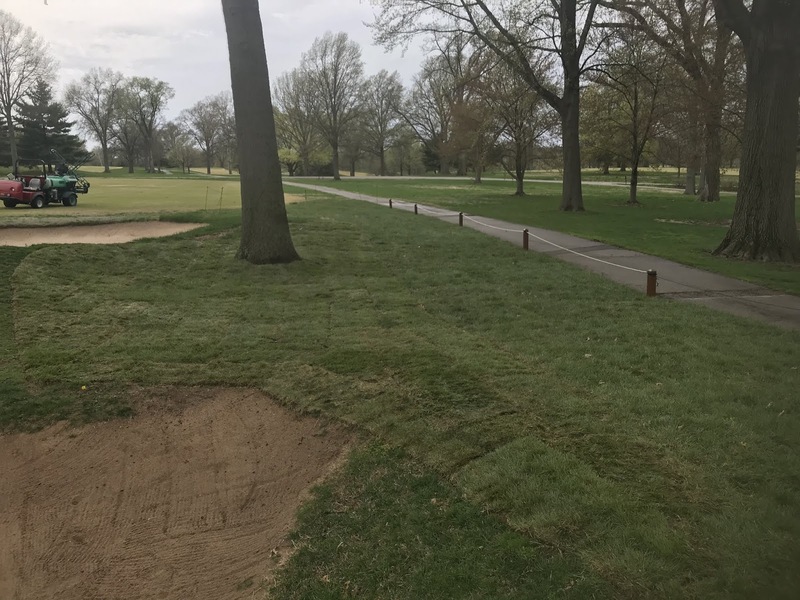 We still have some additional areas to sod around the tree and bunker and will complete this hopefully next week. 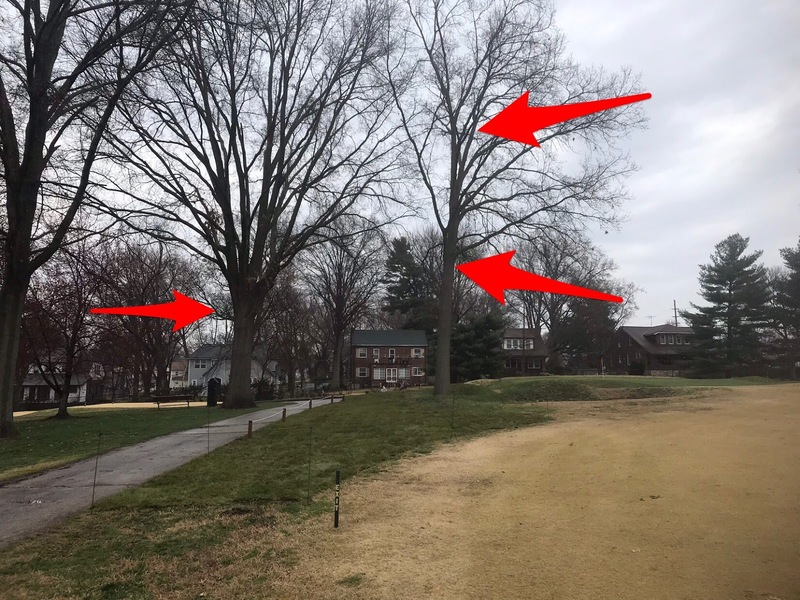 Tree on the left is a beautiful specimen set back in the proper area on the hole. Tree on the right is being over shaded and basically is growing on one side. Leaves, acorns, and other material fall into the bunker regularly. The shade and moisture depletion is significant. 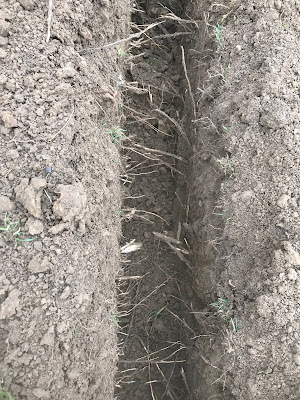 This is the trench that is about 15' deep and shows the network of tree roots from this tree. 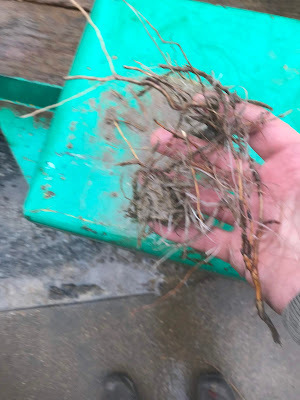 Small 2-3" long turf roots have no chance in a competition for resources with these trees. Aeration completed so that we can then add compost to improve the soil. Compost added to the area. After the area was dragged with a metal drag. Cores busted and some compost moved into holes. Staff finishing up the sod work. You can still see the weakened turf around the tree. It will be replaced in a few days. The staff worked on the 13th approach today and also did a smaller amount of work on the 18th approach. 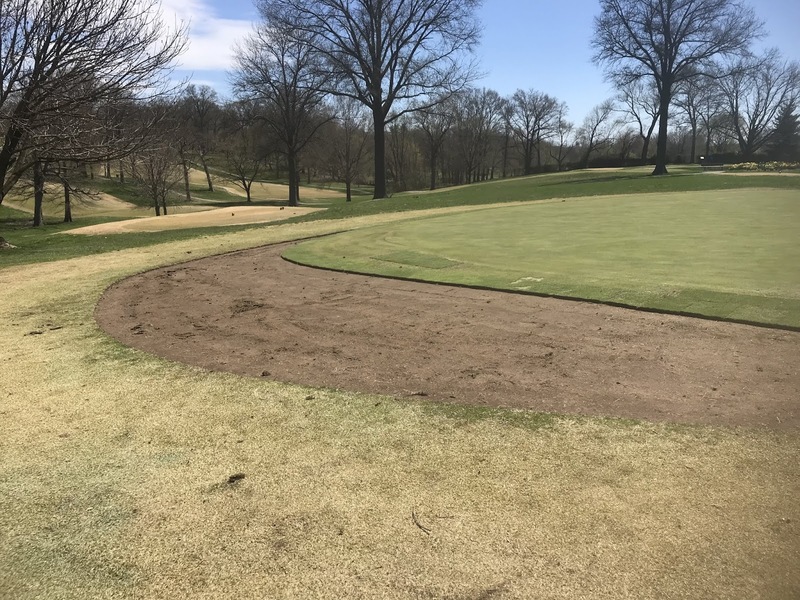 We removed the bent grass sod, repaired part of the collar on 13 and part of the collar on 16. They removed the rest of the material and then laid zoysia in its place. We also had some bermuda contamination and very weak turf in front of 18 approach which was pulled up and replaced. 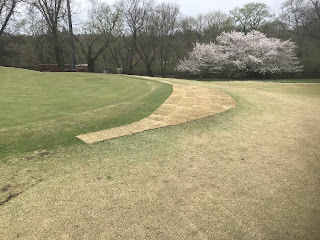 Bent grass sod being reused on collar on 13. Finishing the removal. All of this work is being done by hand. 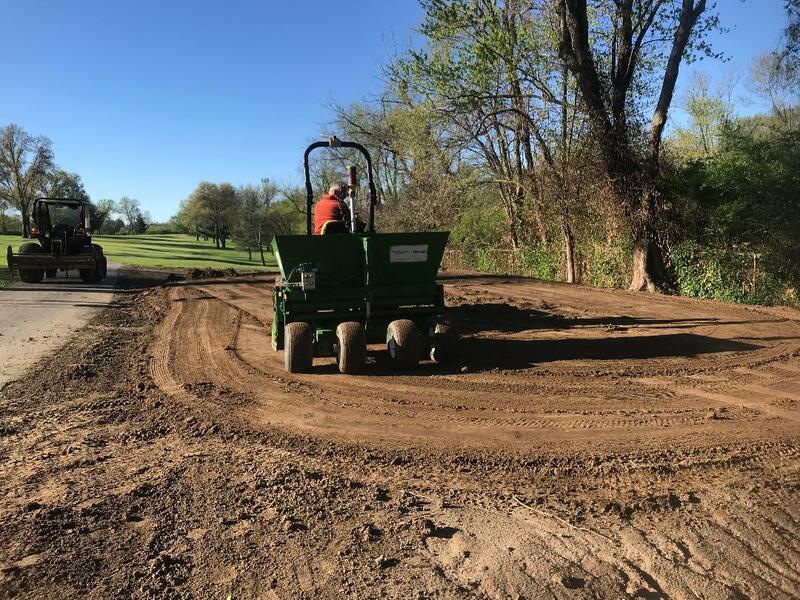 Jason Cutting the old material off of 18 approach. The look from the left side bunker. Same area but from below the area. Finshed area looks great. Still some weakness in front which we will work on improving with aeration, compost and traffic control from our mowing units.